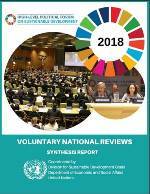 It draws from VNR written reports, and examines efforts made by reporting countries to implement the 2030 Agenda, including challenges, gaps, achievements and lessons learned. The report discusses: assessments, strategies and budgets related to the SDGs; institutions for implementing the 2030 Agenda; leaving no one behind; goals and targets; monitoring and data; coherence with regional and global frameworks; stakeholder engagement; awareness raising; and means of implementation. The report represents a rich tapestry of national experiences in implementing the 2030 Agenda, summarizing 46 countries VNR reports as presented to the High-Level Political Forum in July 2018.